Turns out mother had been watching the newest Indian celebrity cook on television who is on a mission to show how easy and low fat Indian cooking can really be. The samosas in the first episode were enough to put me off. Made with a distinctly non-Indian filling of beetroot and coconut, they were carefully rolled into triangles and deep fried. I thought this was about real Indian food – the non-greasy and easy stuff?? Besides, as I’ve said before, I would rather eat my shoe than cook a samosa from scratch. To mother’s horror, the Bengali cholar dal featured on yesterday’s episode had three teaspoons of sugar. It was also accompanied by the TV chef’s incorrect claim that this was a compromise compared to the heaps of sugar actually consumed by Bengalis. Then shredded coconut was added (horror of horrors, diced is de rigeur) and finally the worst sin ever – mustard seeds. Cholar dal never, ever uses mustard seeds. When a Hindu temple-style khichdi was cooked with onions my mother finally had enough and turned the telly off. Apparently, temple cooking doesn’t involve onions as they are seen to be un-sattvic. Mother’s temper calmed soon enough following a discussion about real cholar dal. I quickly got the recipe for bhaja moonger dal from her – traditional Bengali roasted lentils with vegetables like cauliflowers and peas. I remember eating a variation with prawns in my auntie’s house in Kolkata. Mother and I cooked this together, with a little bit of sugar, and it was delicious, and dare I say it, authentic. All you will need with this is a bit of steaming hot basmati rice on the side. Easy Indian cooking at its finest. Roast the moong dal in a large pot over a high flame for five minutes, stirring regularly, until a heady aroma fills the air. Now take the pot off the flame and fill it with cold water to rinse the lentils. Drain the lentils and fill the pot with fresh cold water. Add the turmeric to the lentils and bring to a boil on a high heat. When it starts bubbling, lower the flame to medium and continue cooking it. In the meantime, take a smaller pot and heat the oil on a high flame. When the oil is hot, add the sugar and within seconds the whole spices. As the spices start sizzling, stir in the ginger and red chilli powder and fry for a minute. Now add the prawns, peas and the tomato puree, if you are using it. It gave the dal a lovely rounded flavour. When the prawns are well coated with the masalas, stir this entire mixture into the pot of lentils. Make sure all the masalas are used, scraping any remnants from the little pot. Cover the pot and simmer the dal for 10 minutes, allowing it to finish cooking with the whole spices. It’s ready when the dal is soft and integrated with the water like a soup. Add salt to taste and serve piping hot. hehe… i can totally imagine your Mom’s facial expression at watching the episode! Just the other day my Mom happened to catch an episode of Paula Dean on Food TV and almost fainted at the amount of butter and sour cream she used in her food. But I have to ask, what is it with Beetroot Samosas these days? I’ve been having a carzy woman spam my Inbox and Comments section requesting an authentic Beetroot Samosa recipe. As far as I’m concerned, if it’s not filled with Potatoes and Peas, it’s just not up my alley! I was blog-hopping & landed here. You have a very nice blog with great pics!I love the way you tell your stories .I have to come back here when I have some more time. When did deep frying anything became “light” ,I fail to understand! Dal looks great,simple and delicious. I went to Gujarati restaurant in NY last year for veg. buffet.Their food was not only very spicy,it was full of sugar too.A strange taste of hot and very sweet,which I didn’tlike! Thanks ladies. I thought the whole thing was fabulously entertaining! If this trend for beetroot samosas continues, we’ll all be wondering what’s next! 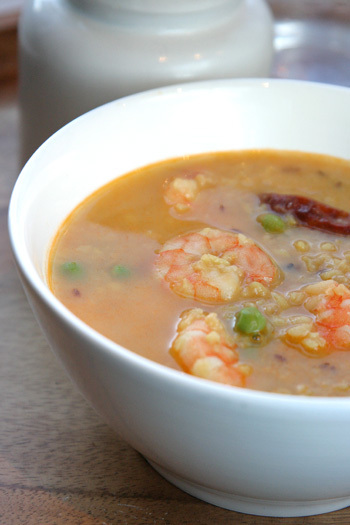 Joanna – Moong dal is the green mung beans, huskless and split. They are yellow and oblong in shape. The orange/red ones used commonly are red lentils or masoor dal. I’m normally the silent observer type but just had to let you know I love this site and have tried many of your recipes and can’t wait to try them all. I find the recipies easy to follow, ingredients easily available and results delicious. My favorite recipe site. Many thanks. Planethalder – well spotted. My mother is dying to be on television… LOL! This looks really good. Your blog is one of my favourites. 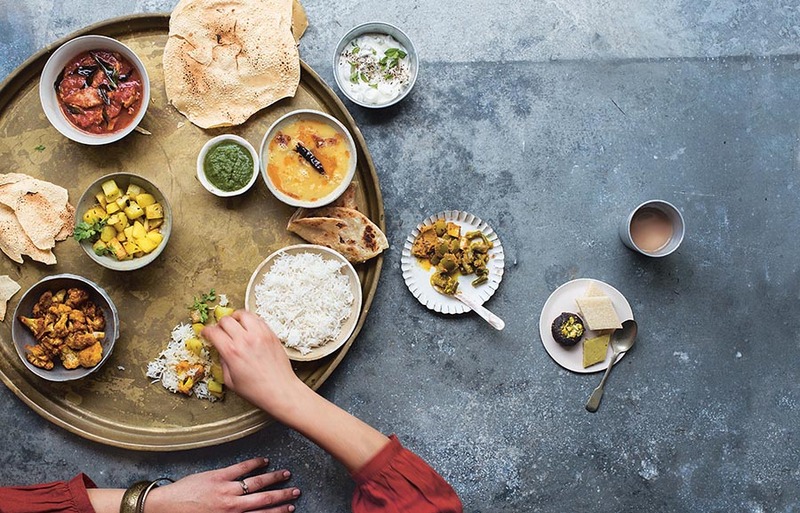 If it’s any consolation, the programme inspired me to seek out blogs on Indian cooking to add to the rather paltry collection of food links I have. Yours was the first I found and is easily the best yet. I just watched the episode you mentioned but I think you made a mistake. The samosas were baked in the oven and not deep fried at all. So what was your point? Hello Mallika, I searched for your blog after seeing you with Madhur Jaffrey. It is wonderful and I shall be making a lot of your recipes. Is this the Dal recipe you made in the episode? Unfortunately, it didn’t make it into the book. Thankyou Mallika for your reply. This is on tonight’s dinner list. I live in Adelaide, South Australia and we have gorgeous seafood. Our prawns are exceptional and I always like different ways to cook them. Wonderful website for working mums like me. One thing we have in common is both places we originate from (I’m from Kerala) comes with abundance of seafood. This recipe looks so appetising. Can I use Toor dhal instead?